An empty giant on Riverside Drive, built in 1936. People often complain about Houston's flat, uninspiring terrain -- the topological equivalent of the doldrums, almost. But those people have probably never ventured south on Highway 288 to a sleepy neighborhood off MacGregor called Riverside Terrace. Long a stronghold of the marginalized yet affluent members of Houston society -- first Jews, then African-Americans, and now gays -- the neighborhood has been overlooked throughout the city's history. Looping streets flow along the same path as Braes Bayou and the smaller gulleys that run through the neighborhood. Rolling hills of verdant green dip easily into kudzu-covered streams while Spanish moss hangs in dense curtains from the thick oak trees lining the neighborhood. In the middle of Riverside Terrace, a mossy pond sits in repose amid a thicket of trees and the heavy, moist air. The streets are quiet here, home to some of the city's best examples of architecture from the late Art Deco and Mid-Century modern eras. These are some of Houston's finest homes that history has all but forgotten. Riverside Terrace was established in the 1930s, a home for Houston's wealthy Jewish community who were forbidden by an unwritten gentleman's agreement from building or living within the WASP-y enclave of River Oaks. Families like the Weingartens, the Sakowitzes, the Battlesteins and the Fingers built their homes in the sleepy neighborhood just east of the Medical Center and Hermann Park. ​Notable architects built homes for these families, such as Houston's own John Chase and John Staub, as well as Birdsall Briscoe and Bolton & Barnstone. From the 1930s until the post-war era, the neighborhood eventually became known as the Jewish River Oaks although non-Jewish families had settled into the neighborhood, too, by this point. This demographic began to change drastically in the 1950s, however, when the first African-American family moved into the neighborhood. A wealthy black cattleman named Jack Caesar and his family purchased a house in 1952. It was a contentious settlement from the beginning, as Caesar's white secretary bought the home for him and transferred the title to the family, who moved into the house under cover of night. Such precautions were necessary, it turns out, as a bomb was detonated on Caesar's front porch only a year later -- a sign that the new neighbors weren't exactly welcome. Despite this, Caesar and his family stayed put until the widening of Highway 288 occurred in 1959, which destroyed many of Riverside Terrace's beautiful homes in the process -- including Caesar's. But by this point, the neighborhood had become predominantly African-American and white flight to the suburbs was in full swing. 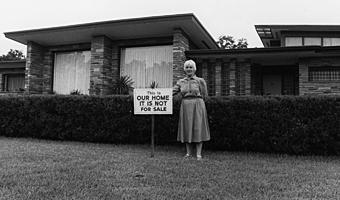 In the late 1960s, one last effort was made by the remaining white and Jewish families in Riverside Terrace who were being pressured to leave their homes not only by their neighbors' departure, but also by real estate agents who wanted to earn commissions selling the expensive homes to black families: signs were erected in yards that read "This Is Our Home; It Is Not For Sale." A fascinating 1985 documentary of the same name was made about the last-ditch effort of families to remain in their homes, although eventually all but a few whites and Jews succumbed to societal pressures and left Riverside Terrace entirely. It wasn't long before Riverside Terrace was once again home to prominent, wealthy families -- this time of the African-American set. College professors, doctors, lawyers and politicians moved into the large homes and mansions. But as time progressed, more homes in the neighborhood fell by the wayside, abandoned due to foreclosure or neglect. Today, the neighborhood is experiencing a revitalization of sorts as housing prices remain consistently strong in Riverside Terrace despite the economy and as gay couples and families move into the neglected Mid-Century mansions and spruce them up. However, too many homes in the once glorious area have been left to time and the elements. Driving through the neighborhood today is a study in contrast. A well-tended home and manicured lawn sit directly opposite a decaying mansion. Overgrown and unnavigable alleyways lay hidden behind otherwise well-kept houses. Blue tarps -- a reminder of Hurricane Ike's damage -- still decorate the roofs of many houses. Junked-out cars and household detritus litter the front lawns. What will become of Riverside Terrace? With its stunning natural beauty and enviable location only steps from downtown, the Museum District and the Medical Center, it wouldn't be surprising to see this area become the newest enclave of Houston's well-to-do. The steady and rather depressing encroachment of three-story stucco townhomes seems to echo this sentiment. One would hope that the neighborhood's fascinating history can be maintained and celebrated. But in a city like Houston -- where last week is but a vague memory and preservation a waste of time -- Riverside Terrace's future is still uncertain. For more images from Riverside Terrace, see our slideshow.